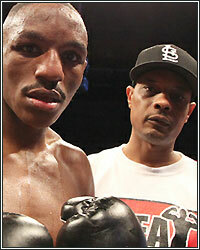 DEVON ALEXANDER: "I'M GOING TO CUT THROUGH THIS BOY LIKE A HOT KNIFE GOING THROUGH BUTTER"
Ask and ye shall receive. In a recent interview, IBF welterweight champion Randall Bailey made it clear that he was tired of hearing world-class trainer Kevin Cunningham doing all the talking for Team Alexander, stating, "Devon needs to come out of hiding and speak for himself...If Devon this shy now, what he gonna do when it's time to fight me." Upon receiving word of Bailey's comments, Alexander himself wasted not time to respond. "This dude is doing all the talking. He calls me out; says he's going to KO me. He claims he was trying to get at me when I was with Don, but never got me, so it's on now. He started this crap, but I'm going to finish him." Alexander and Bailey have agreed in principle to face each on a September 8th card televised on Showtime. Although a venue has yet to be determined, it makes sense for the bout to take place in Alexander's hometown of St. Louis, where Golden Boy Promotions can maximize the revenue generated at the gate. Bailey, however, prefers for the bout to take place in a neutral setting like Las Vegas, despite the fact he openly admits that he'll need to score another knockout to prevent the fight from going to the scorecards, where the more technical Alexander would likely be favored to win. As far as Alexander is concerned, he's just happy for another shot at a title, and the location of the fight isn't going to prevent the beating that he's planning on dishing out. "You know me, Ben. I don't do a lot of rapping, but my hands will make a lot of noise tapping this dude upside his head. I'm thankful for the opportunity to win another world title and on September 8th, I'm going to cut through this boy like a hot knife going through butter," Alexander continued. Be sure to check back soon as this war of words continues between both camps.